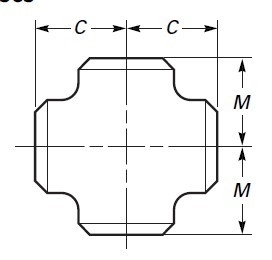 Crosses - Stainless Steel Pipe Fittings, Flanges, Valves,Maxbright Group Inc.
GENERAL NOTE: All dimensions are in millimeters. (1) Outlet dimension M for NPS 26 and larger is recommended but not required. (2) Dimensions applicable to crosses NPS 24 and smaller.